The Auto-BCC feature has been a long requested feature. 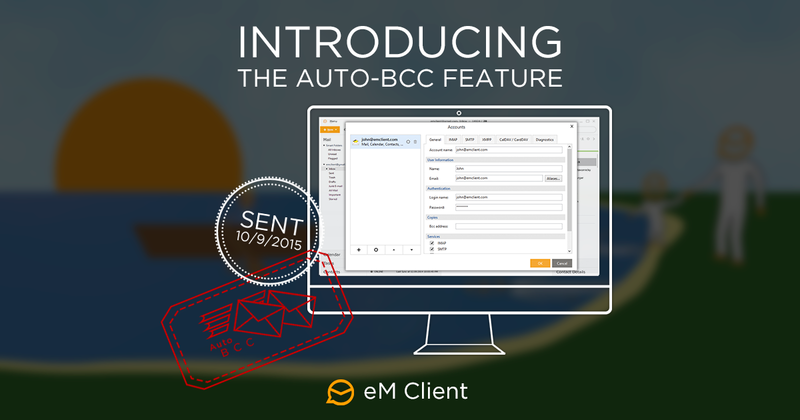 eM Client 7 will feature Auto-BCC amongst its default features. You can find this option in your account settings and specify Auto-BCC for all your outgoing messages for each account specifically. For those who are not familiar with the feature, Auto-BCC allows you to automatically send a hidden copy of your outgoing messages so the recipients of your message won’t be able to see that the copy was sent to the specified e-mail. Auto-BCC can often be used to submit a copy of a work related email to your personal email or notify someone about responding or updating the message on a company account.